The young captain Erwin Rommel was also involved in the attack on Focșani, commanding a detachment of the Wurttemberg Mountain Battalion. His actions are described in a book published in 1937, “Infanterie greif an” (The infantry attacks). However, there is one thing that still puzzles historians: who took Odobești Hill, Rommel or Lieb? The defeat at the Battle of Bucharest forced the Romanian troops to withdraw to Ploieşti and then to the Râmnicu Sărat line, where they failed to stop the advance of the Central Powers. 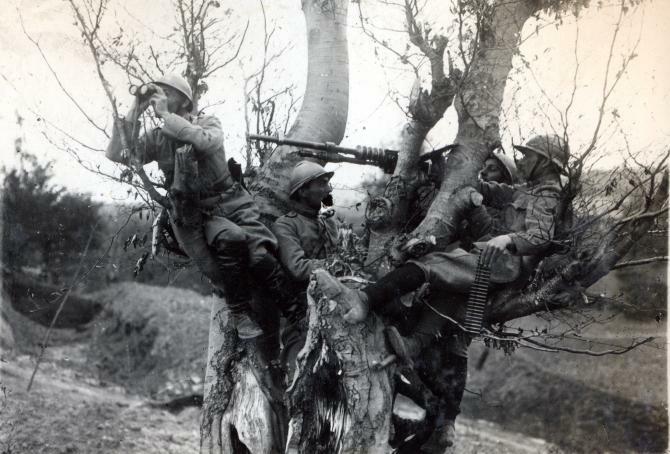 Consequently, the Romanian-Russian troops withdrew to Focşani and to the Siret line. Despite Falkenhayn’s hesitation, the German Supreme Army Command insisted that the city of Focșani be taken by the German Ninth Army. Falkenhayn had reservations because his troops were physically and morally exhausted and that “if only the Romanian army was confronted, it would have been able to defeat it with great probability, but the situation changed with the appearance of powerful Russian units”. Falkenhayn, too, admitted that if he gave up on Focșani it was going to be the end “of the most brilliant campaign of the Ninth Army”. To motivate the soldiers to fight, Falkenhayn informed the commanders that “this offensive was going to be the last one”. Focșani was the gateway between Muntenia and Moldavia, an important strategic centre for a future Central Powers campaign in Moldavia. The most important battle was for the 1.000-meter-high Odobești Hill, which overlooks the Putna Valley, 13 kilometres northwest of Focșani. By taking this strategic point the Germans hoped that the city would soon follow suit. The battle for Odobeşti Hill began in earnest on January 4, 1917, when units of the German Alpine Corps and the Wurttemberg Mountain Battalion assaulted this position. The heights around Odobeşti Hill were defended by units of the 3rd and 12th Romanian divisions. Between the units of the Alpine Corps, climbing the southern slope and the Wurttemberg Mountain Battalion, climbing from the west, a competition started to see who would be first to reach the top. Erwin Rommel, then a young captain, commanded a detachment of the Wurttemberg Mountain Battalion and Lieutenant Lieb the other. Rommel led his soldiers vigorously, being always in the front line of the battle, when he had doubts about the enemy, his tactic was always to attack, relying on a careful reconnaissance of the battlefield. The Romanian troops here were taken by surprise by the energetic attack of the detachment led by Rommel. Without communications, the Romanian soldiers could not coordinate their defence. Rommel also remarked: “The Romanian leadership seems set on not doing anything. Regarding the troops, you have the impression that they are wandering through a rough and wooded mountainous terrain without any precise order and without any contact with each other”. On the southern slopes, the Alpine Corps faced a stronger resistance from the Romanian soldiers. “A Romanian battalion fought hand to hand for an hour and a half before being defeated, leaving behind 170 dead and injured”. The two detachments reached the top at about the same time, a situation that, after the war, gave rise to a controversy over which was the first to occupy the Odobești Hill. That night, the two detachments of the Wurttemberg Mountain Battalion reached the Tarniţa monastery, on the eastern slope of the hill. They could not enjoy too much rest because the Alpine Corps arrived shortly, and since its commander was higher in rank than Rommel and Lieb, the Wurttemberg Mountain Battalion members had to move to some nearby huts where they “spent a most terrible night”. The next morning the soldiers commanded by Rommel advanced to Găgești and the Putna River. The Odobeşti Hill was the central element of the Romanians’ defence. At the hearing of the news that the Germans occupied this position, the Romanian general Alexandru Averescu ordered the Romanian-Russian detachments from the region to take it back. This was almost impossible because the German and Austro-Hungarian forces were in full offensive. The conquest of the Odobeşti Hill secured the advance of the Ninth Army to Focșani and the conquest of the city.